>>> Please visit our Treo Store to find the bestselling Treo 800w accessories and Treo 800w cases for your smartphone. During his keynote presentation at CES a slide behind Bill Gates clearly showed a new Windows Mobile Treo smartphone (image right) that looks quite different to any leak that we have seen before and which many are guessing is none other than the highly anticipated Treo 800w with built-in GPS and WiFi expected to be released in the coming months. There is no way to know if this image is just a mockup or a final design but initial reactions have nonetheless been very positive. This rugged and robust looking Treo 800w smartphone appears noticeably slimmer than the Treo 750 while retaining a large 320x320 touchscreen and full size QWERTY keyboard. The only thing that I’m slightly confused about is the fact that the recently leaked Vodafone specifications of a Treo Drucker (future Windows Mobile Treo smartphone) mentions that it will have a “flush screen” when this image clearly shows that the screen is still unfortunately recessed. I thus have to assume that there is the possibility that a Treo 850w may also be in the works. Purely from a design perspective I feel that Palm urgently needs to release a new line of devices with flush screens in order to make them look considerably more modern, attractive and appealing. The non-touchscreen Treo 500 clearly demonstrated the design benefits of a flush screen and I can’t wait to see a touchscreen version implemented on a Treo or Centro as soon as possible. While a flush screen is more modern, I would think it would be easier to scratch and easier to see a protective film on it. Also, I would think it would be more prone to accidental "taps" if the lock isn't used. While my 680 is maybe not the most modern looking device, the non-flush screen works just fine. A flush screen may be more modern but I think it looks awful. Unless all Treos become flush screen, I'd never buy one. When will we be ( the rest of us) honored by a Palm working like a Palm ? I had been with Palm since is Palm OS days (V), I have to agree with Serge as per the operation of of WM Treo had yet to be on par with Palm OS device. No doubt, WM OS devices have wonderful sync capability with Windows OS PCs, but the frequency it crashes make me want to shy away from Treo altogether. Anyone believes the 800W will be any better? Please restore my faith in Treo, Palm! Windows! NO! NO! NO! Back to the drawingboard! Personally, I don't know why you guys bother with Windows-based phones. Posts, like the one above by Spiralcross, can be found all over the place. RIM makes a good OS. Palm finally fixed (mostly) their OS with the latest patch. And, if Windows can't run a PC very well, why trust it to your business mobile phone? Regarding the flush screens mentioned in the blog. Uh, what is the benefit, Andrew, of a flush screen? It looks pretty? Is that a real benefit? Does that make the phone work better? I have no desire to see a flush screen Treo. I like my protective screen cover staying where it is, and the recessed screen makes that possible. You said this looks quite different to any other previous pictures / leaks to the web.. doesnt it look nearly identical to the Treo 800w picture we've already seen... just with a dark speaker and dark navigation area? Anyways, I love windows mobile and have personally owned the Treo 650 (Palm), Treo 700w|x (Windows Mobile 5) and Treo 755p (Palm). My windows mobile device crashes less than either one of my palms did. I actually had the 700w|x before the 755p and sold my 755p to buy another. Its nice being able to multi task (I am definetly a power user) and see everything in one place, i.e. my email, calander, txts, and tasks. I love the Treo form factor and the WM5 operating system. So why don't we stop hating on WM5 and just understand that different people like different things. Tbolt I agree 100% with you. More memory and megapixals. Stable OS please!! What good is a flush screen? I want someting that works for me, I'm less concened about looking good. Uh, I hate to burst the bubble but it appears this is just the new "centro." Not the 800. As for a the 800: I second the megapixel/video comment above, and I would like to add a flash (c'mon, they're cheap!). That for me is the biggest kicker, and I predict that's what the iPhone will come out with next. Otherwise, I'm with palm OS also. I just feel like there's a much greater likelihood of cool stuff getting made for it. 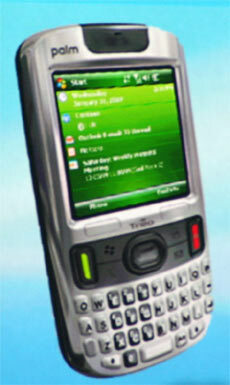 I hate to burst YOUR bubble.. it says Treo right on it, and it is running windows mobile - it is not a centro. I'm going with Andrew (and everyone else in the world) and am guessing this is the 800w (or possibly an 850). I have to disagree with your plea for a flush screen. I carry my treo in my pocket and if not for the recessed screen I would answer or ignore every incoming call by accident. Not everyone likes to have a phone case hanging off their belt. I depend on multiple Windows applications, multi-task, and have a love-hate relationship with my Treo 700w. The primary memory constraint is aggravating, as is the inability to upgrade to WM6. I use Delorme's BT GPS with Google Mobile Maps quite happily, except when in a dead data connection zone (Verizon). With more memory, Street Atlas 8 would be a happy camper: no data connection needed for GPS! Please -- bring on 800w with built-in GPS and more memory. I'm standing in line . . . I chose the Treo for two reasons: More apps and the fact that the BB is not being used by the organization. I'm also deep in IT technical trade, and I've always held the notion that "computers do what you tell them to do, whether it's what you wanted or not". Until now. This is probably the worst phone I've ever owned in my life. I used to even sell cell phones when I was younger, and 15 years later, I still think this is the worst. *The menu latency is so bad that pressing buttons or buffering a selection leads you awry. *The ringer only goes as loud as a fly sneezing. Testing sounds and ringers is loud, but actual ringing and alerts are about 60% softer than the test. EVEN with a reg hack. *The touch screen is mostly taken advantage of by someone's ear duing a call. My ear has kindly reprogrammed many aspects of the phone while I talk. *Menu's override immediate call instances or block notifications (like answering the phone) if pressed while getting the phone from the holster. (Modal windows don't always stay modal, and layering causes graphical refresh issues). *The battery is incredibly disappointing and constantly needs charging. *With the new USB adapter style, it does not work with "any ol' USB cable" - which hurts when you're in a pinch and makes the battery charge-cycle an issue. *The phone needs to be reset at least twice per day to actually connect to activesync. Sure, I hoped that most of this was due to having a lemon, but I've learned that it's not. It's a real disappointment cause the phone looks great, it's scratch-resistant, has great resolution, wi-fi, cures cancer, etc. I thought I was frustrated with BBs, etc. but this takes the cake. I'd rather carry a laptop and use a softphone on Windows ME.